Body lift surgery is appropriate for those who have lost significant amounts of weight resulting in large amounts of saggy skin all across the body. It is also suitable for women who have large folds of loose skin due to multiple pregnancies. If both an upper body lift and lower body lift are needed, to allow adequate healing time the surgeries will be done months apart. Body lift surgery is not recommended for people who are morbidly obese. It is ideal for people who have reached their ideal body weight. The best candidates for body lift surgery are healthy and committed to leading a healthy lifestyle with proper nutrition and fitness. Body lift surgery may be an appropriate procedure if you have had considerable weight loss and have significant soft tissue looseness in one or multiple body areas. It is important to have realistic expectations about body lift surgery results. A body lift (sometimes called body contouring surgery) is a surgical procedure to remove excess skin and fatty tissue from the middle and lower abdomen, hips, outer thighs, back, buttocks after extreme weight loss. It can also tighten muscles of the abdominal wall. Body lift surgery is not a treatment for being overweight. People who are obese and intend to lose weight should delay all forms of body lift surgery until they are close to their desired weight. A stable weight needs to be maintained for at least six months before the body lift surgery can occur. Who is body lift surgery for? Patients suited to having a body lift are those who are at or near their goal weight after having gastric banding or gastric bypass surgery (bariatric surgery). Other people suitable for body lift surgery may have lost a large amount of weight through diet and exercise. Having heavy excess skin can contribute to poor self-esteem about your body image, despite weight loss. There are also side effects of the having excess skin that are related to hygiene, skin rashes and infection. If massive weight loss has resulted in excessive skin folds preventing you from being able to fit into normal clothes, a body lift may be appropriate. What is the difference between a body lift and tummy tuck surgery? The lower body lift and tummy tuck surgeries both tighten the abdominal muscles to flatten them. However, the lower body lift goes further than a tummy tuck. If your outer hips, love handles lower back, and buttocks trouble you, a lower body lift may be the more appropriate surgery for you. The lower body lift involves making an incision that extends completely around your body to remove fat and skin from your torso. Your surgeon will make an incision just above your pubic region and around your hips to meet in the back. A lower body lift removes skin and fat from your abdomen, outer hips, lower back, and buttocks. This results in a flatter abdomen, contoured outer thighs, and a lifted buttock. Body lift surgery is often performed in conjunction with liposuction of the fat on the buttocks. The surgery can take between 4 to 5 hours. Some body lift patients have 20 to 30 centimetres in height of skin removed from around their body. This skin can weight between 4 and 6 kilograms. While recovery after body lift surgery can be marked by extreme fatigue, most patients enjoy the results. In comparison, tummy tuck surgery only removes fat and skin from the central abdomen. In most cases, tummy tuck surgery doesn’t address the buttocks or hip area. Read more about tummy tuck surgery here. 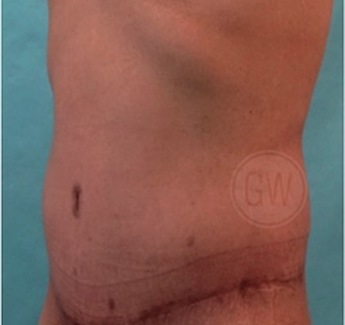 Body lift surgery is performed under general anaesthetic in hospital. You will need to stay in hospital for 5 to 7 days. A common lower body lift technique uses incisions similar to a bikini pattern to tighten the abdomen, groin, waist, thigh and buttock in one procedure. A circumferential incision around your body removes an apron of excess fat and skin to tighten and reposition tissues. Advanced surgical techniques usually allow incisions to be placed in strategic locations so they will be hidden by most clothing or swimsuits. To achieve an improved body contour, liposuction may also be used. A combination of liposuction and surgical body lifts may be necessary to achieve an improved body contour. To form the newly shaped contours, deep support sutures are used within underlying tissues. Sutures, tapes, skin adhesives, or clips are used to close your skin incisions. The results of having a body lift are visible almost immediately after surgery, although it takes several months to fully recover from this extensive procedure. What are the specific risks and complications of body lift surgery? Recovery times for body lift will depend on which type of procedure is performed. Lower and mid-body lift surgeries typically require at least 2 to 4 weeks of healing and rest. Total body lift surgeries often require at least 6 weeks of recovery. After body lift surgery you can expect to have swelling and bruising. Any pain or discomfort you experience can be managed with medication. If you experience chest pains, shortness of breath, or unusual heart beats it’s vital that you seek medical attention immediately. These complications may require hospitalization and additional medical treatment. You will have dressings and bandages on the incisions during your body lift surgery recovery. To drain any excess blood, you may have small, thin tubes temporarily placed under your skin. The health team will give you instructions as to how to care for surgical sites including how to care for your drains and what medication to take. After your body lift surgery, you will need to wear a compression garment during the day and at night for at least 2 weeks. This will provide support for the healing area and will minimize swelling and bruising. As soon as possible, light activities are encouraged with most patients returning to normal daily activities within 3 weeks. It is recommended that more strenuous physical activity should be limited for at least 6 to 8 weeks. However, it may be up to 12 weeks before you feel as though your energy levels have returned to normal. Any bruising will disappear within a few weeks, with swelling subsiding in a few months. While your body lift scars will be permanent, they will fade in about 12 months and can be hidden by your clothing. It is very important to be clear about your expectations of the body lift procedure, to understand the recovery process and the likely results you will achieve in the long term. Body lift surgery is not for everyone and requires a significant recovery period. We suggest you make a shortlist and consult with a few Cosmetic Surgeons. You can find the best Australian Body Lift Surgeons here. So you can make an informed decision, your elected surgeon will discuss the possible risks associated with a body lift. Although the majority of patients do not experience these complications, it's important to understand how they can be managed in the event that they occur. After having weight loss surgery almost two years ago and losing close to 40kg I was still left unhappy with my body, which was a very difficult mind set to be in. Obviously I was happy with my weight loss but now I was self-conscious of the excess skin this created. I have battled my weight since I was 14. I was always very active at school playing sport 5 nights a week but once puberty hit my weight ballooned out. At my heaviest I weighed 115kg and I am only 160cm tall. Today I weigh 56kg and for the first time in around 30 years I am in “the healthy weight range.” I am a Registered Nurse and work in a hospital that Dr Choy operates at. I have nursed many of Dr Choy’s patients and was really impressed with the results they were getting, not to mention the care and attention Dr Choy showed to his patients. So after much research and many discussions with Dr Choy’s patients I decided to have a consultation with Dr Choy. From the first consult Dr Choy and his team instilled so much confidence in me I decided to book in for my surgery. I had a radical abdominoplasty, bilateral flank lipectomy (muffin tops removed) and a breast reduction lift. Effectively I have a total body lift! The difference this has made has been life changing. I am now able to buy clothes that fit me properly and I am no longer self conscious of the excess skin that used to hang over the sides of my jeans or shorts. My breasts look incredible (even if I do say so myself!) and are sitting where they used to when I was a teenager - actually they are probably better then they have ever been. I have gone down another size in clothes just from having this surgery. The entire process has been life changing and dealing with Dr Choy and his team has been great. Nothing has been too much trouble from having my emails answered promptly to being able to talk to Dr Choy over the phone pre-surgery to answer any questions or issues I was unsure of. The post-op care has also been awesome. I have not had any problems or issues and am able to contact Dr Choy or his Practice Nurse at any time if needed. 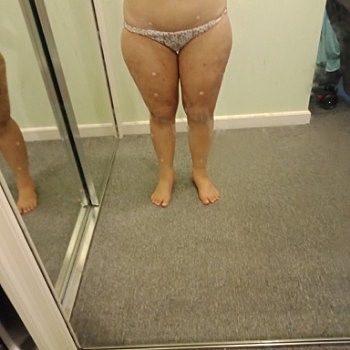 I would recommend this surgery to anyone who is in a position to have it done as it truly has changed my life and given me a new lease on life, shopping and self confidence. There are a lot of “surgeons” out there who do this type of surgery but I would say be very careful who you go and see. I would recommend Dr Choy to anyone with complete confidence. Finally at 43 years of age I am confident in my body, healthy in my body and truly happy with how I look and feel. I no longer dread going clothes shopping and wear clothes from any shop not just the “BIG” girls area or men’s area. I used to wear a size 22 ladies or a men’s XXL now I wear a size 8-10 ladies or a boys 14! Talk about LIFE CHANGING. Thank you Dr Choy! Where to get Leg Shortening?